Preston secured an FA Cup fifth-round home tie against Manchester United with three goals in 10 second-half minutes against Sheffield United. Jamie Murphy gave hosts United a half-time lead in this fourth-round replay against their League One rivals. 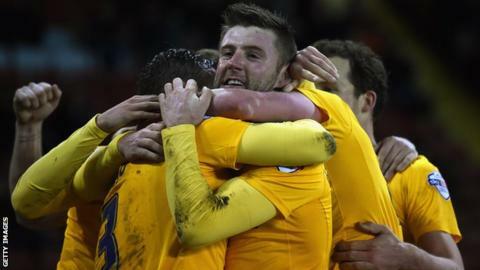 But Paul Gallagher, who scored a stunning free-kick in the first tie at Deepdale, did it again to equalise. Paul Huntington then headed in Scott Laird's corner before Gallagher converted a penalty to secure victory. Preston were good value for their victory against a Sheffield United side who were FA Cup semi-finalists last season. Nigel Clough's team, knocked out of the League Cup at the semi-final stage by Tottenham six days ago, were lucky not to go behind when Preston striker Kevin Davies - a boyhood Blades fan - chipped against the post after latching on to Chris Basham's weak back header. Preston arrived at Bramall Lane without a win in seven matches, and might have been forgiven if their confidence had dipped after conceding a soft goal seven minutes before the break. Sheffield United's defeat was only the third they have suffered in their last 18 FA Cup ties. Three of the sides they beat during that run were in the Premier League - Aston Villa and Fulham last season, and Queens Park Rangers this term. All three of those wins were away from home. Murphy, who signed a new Sheffield United contract at the weekend, collected Michael Doyle's pass and rolled a shot under keeper Thorsten Stuckmann, who probably should have saved it. North End's second-half fightback, though, was emphatic. Home keeper Mark Howard made a superb double save to stop Laird and Chris Humphrey shortly before on-loan Leicester forward Gallagher hit an unstoppable free-kick into the top corner on 63 minutes. The visitors were in front six minutes later, as centre-back Huntington headed in Laird's corner for his second goal in two matches. Clough, who reverted to the side that ran Tottenham close last Wednesday after making 10 changes for Saturday's 2-0 League One victory over Swindon, was unable to inspire a revival in a side playing their 40th game of the season. And Gallagher made sure of the win in the 73rd minute by drilling a penalty into the corner of the net after Humphrey was tripped. "It's been a disappointing few weeks for us but tonight is an excellent result. There was a massive incentive tonight to play Manchester United, and it brought out the best in us. "We had to be focused tonight, because we know how good Sheffield United are. They have done fantastically well in the cups. We had to be at it, and from the first whistle we were really good and dominated, and they scored against the run of play. We kept our belief going. "It's a massive result, and there was a massive carrot for us. Forget Manchester United, we just wanted to get back to winning ways. This result can hopefully now galvanise our league form." "I'm bitterly disappointed. For Manchester United, the biggest club in the country, to come to town as a League One club was a massive incentive. "But we didn't play like that was the carrot at the end of the tie. "Maybe we thought the tie was over when we brought them back here but that is never the case against a team like Preston. "They thoroughly deserved their victory." Match ends, Sheffield United 1, Preston North End 3. Second Half ends, Sheffield United 1, Preston North End 3. Attempt saved. Jamie Murphy (Sheffield United) left footed shot from the left side of the box is saved in the centre of the goal. Attempt missed. Jay McEveley (Sheffield United) left footed shot from outside the box is high and wide to the right. Substitution, Preston North End. John Welsh replaces Scott Laird. Substitution, Preston North End. Joe Garner replaces Kevin Davies. Paul Gallagher (Preston North End) wins a free kick in the attacking half. Foul by Louis Reed (Sheffield United). Substitution, Preston North End. Kyel Reid replaces Chris Humphrey. Substitution, Sheffield United. Diego De Girolamo replaces Michael Doyle. Attempt missed. Paul Gallagher (Preston North End) right footed shot from outside the box misses to the right. Attempt missed. Paul Gallagher (Preston North End) right footed shot from outside the box is too high. Attempt missed. Chris Basham (Sheffield United) header from the centre of the box misses to the right. Corner, Sheffield United. Conceded by Paul Huntington. Attempt blocked. Chris Basham (Sheffield United) left footed shot from the centre of the box is blocked. Jamal Campbell-Ryce (Sheffield United) wins a free kick in the defensive half. Goal! Sheffield United 1, Preston North End 3. Paul Gallagher (Preston North End) converts the penalty with a right footed shot to the bottom left corner. Penalty Preston North End. Chris Humphrey draws a foul in the penalty area. Penalty conceded by Jay McEveley (Sheffield United) after a foul in the penalty area. Corner, Sheffield United. Conceded by Calum Woods. Paul Huntington (Preston North End) is shown the yellow card. Goal! Sheffield United 1, Preston North End 2. Paul Huntington (Preston North End) right footed shot from the right side of the six yard box to the bottom left corner. Assisted by Scott Laird. Corner, Preston North End. Conceded by Robert Harris. Attempt saved. Robert Harris (Sheffield United) left footed shot from long range on the left is saved in the top centre of the goal. Goal! Sheffield United 1, Preston North End 1. Paul Gallagher (Preston North End) from a free kick with a right footed shot to the top right corner. Chris Humphrey (Preston North End) wins a free kick in the defensive half. Attempt saved. Scott Laird (Preston North End) left footed shot from the centre of the box is saved in the bottom left corner. Foul by Marc McNulty (Sheffield United). Kevin Davies (Preston North End) wins a free kick in the defensive half. Attempt blocked. Scott Wiseman (Preston North End) left footed shot from outside the box is blocked. Scott Laird (Preston North End) wins a free kick in the defensive half. Attempt saved. Tom Clarke (Preston North End) header from the centre of the box is saved in the top centre of the goal. Marc McNulty (Sheffield United) is shown the yellow card.